Ran Saki is a very shy 20 year old who dissolved into blushes and giggles whenever mention was made of her very pregnant condition. We all joked with her on the first day of training and told her that she could have her baby on the last day of training, but for the training the baby must stay put. She and the other ladies were very amused by our jokes and throughout the training the atmosphere among the ladies was always pleasant and they all became good friends. It is not cultural to speak of pregnancy openly in either Nepali or Maithili culture, no matter how obvious it is. Ran Saki was diagnosed with leprosy about 9 years ago when she was 11. 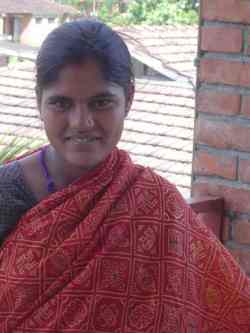 As a direct result of having leprosy she has experienced isolation and exclusion from normal village activities. It seems quite common for pubescent children to contract leprosy. Prior to the Independence Training Ran Saki had little experience of either painting or embroidery, although she was very grateful for the opportunity she was doubtful about her own ability. Like the other ladies on the training, she has attended the two-week residential self-care-training course here at Lalgadh. This course is now being copied by other Leprosy Organisations as it is now widely recognised as a great tool for the prevention of disability and addressing stigma issues. During the course people are encouraged to share their difficulties and provision is made for private talk sessions. Calling Ran Saki for the training proved not to be as simple as we thought and it highlighted the commitment needed by staff here at Lalgadh. Lalita and myself went to her village (or so we thought). It was a very wet day, monsoon was in full throttle, and dumping gallons of water from the skies. To reach Ran Saki’s village we had a 45 min slide through the rice fields, I say slide, as no way could we walk on the very thin walls that edged the rice fields. How Lalitta managed it in a sari will remain one of life’s little mysteries and she carried an umbrella! After we had become thoroughly wet and had a liberal covering of mud we were told that it was the wrong village so we sent a letter to the correct (we hoped) village with a message about the training. On our return trip we saw again the couple who had misdirected us, the lady then proceeded to tell us that she had remembered Ran Saki and knew we went in the wrong direction! Still following a “bath”, at the village pump (much to the locals’ amusement) we headed back to Lalgadh in the landrover. Ran Saki came for training and was surprised to find that not only could she learn to paint but that she was good at it. At the end of the training we asked her what she thought of the training. She smiled and said she now believed that she could improve her life with what she had learnt, even though on arrival she did not really believe it possible. She told us that in her opinion it is a good type of work for her in many ways, first when her baby is born she will be able to care for her and still work. Also not having to walk or stand a lot means that her feet should be safe from ulcers. Mostly she could see that people in her village would have respect for her when they saw she could earn money all by herself. She said “Maybe I do not need to be afraid anymore that my husband might leave me because I have had leprosy”. Not only does she feel more confident that she can earn a living but she feels confident she could teach others how to paint and sew. Independence is something we take for granted in the West. For people affected by leprosy it is a dream some believe they will never have in reality. Ran Saki is now the proud Mum of a beautiful daughter.